The Omissa Circum Saddle Bag has been crafted from soft lamb suede and supple matte calf, resulting in a style that nods to 70's classics but is definitively contemporary. The Omissa Circum features a long chain strap which can be worn cross-body for hands-free convenience (and can doubled under the flap to wear the bag shorter), an extra wide leather shoulder panel, dual compartment main body with phone pockets and zip pocket, and an additional external back pocket. 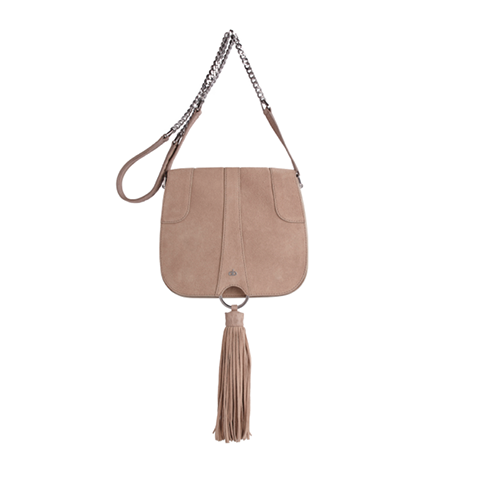 The suede tassel is completely removable for when a simpler look is desired, and can double as a key ring later on. It is subtly branded with the AVGVS serpent motif in ion-plated gold. Store your item in its AVGVS dustbag when not in use to keep it pristine. Cleaning with a soft damp cloth is recommended. Be the first to review “OMISSA CIRCUM SADDLE BAG BLACK CALF LEATHER” Click here to cancel reply.